This book is old school. It’s an excellent and fascinating overview of needlework, first published in 1884. I originally found it in a Half Price Books store, but it’s also available free on the internet (copyright expired) from the Gutenberg Project Encyclopedia of Needlework or at Encyclopedia of Needlework although this seems to not quite match the Complete Encyclopedia of Needlework print edition I have (I can’t find the individual monogram’s section). 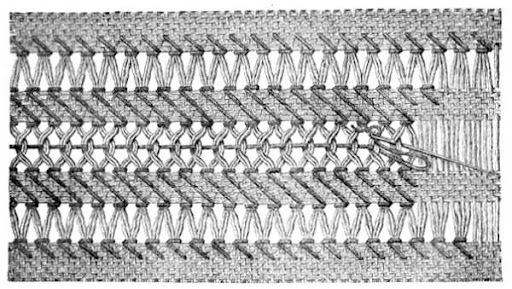 It covers an amazing amount of ground – it covers a huge number of techniques, and there are example patterns of embroidery from all over the world. My hardcopy clocks in at just under 800 pages. The author, Therese de Dillmont, was a true artist and chose a lot of very nice patterns. The diagrams and explanations are really clear. I plan to try incorporating this into my work sometime soon. 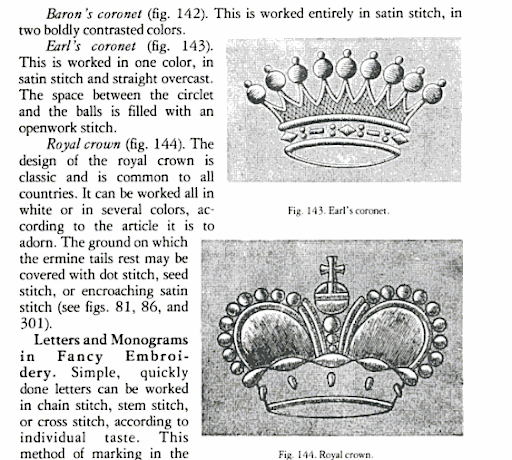 I enjoyed the monograms section too – quite a few very original ideas on filling letters, and some interesting details: Therese de Dillmont provides separate patterns for the nobleman’s coronet, the Baron’s coronet, the Count’s coronet, and a royal crown, to be included with monograms. This entry was posted in Book reviews, books, Free resources online, Historical and tagged embroidery, free books, historical. Bookmark the permalink. Well, you have to say for Mme de Dillmont that she’s precise about what she says! I suspect she bases her stitchings for the different crowns and coronets on the way they are represented in heraldry.